The major scale has seven notes, which serve as the root notes for seven different chords. Any of these chords could function as the tonic of a progression. A song can focus on the I, ii, iii, IV, V or vi chord. You rarely find the vii chord as the tonic. The focus of a progression on any one of these chords will result in different sound qualities of the progression, which are described as different modes. In the first volume of Fretboard Theory I identified chord progressions relative to the parent major key regardless of which chord was functioning as the tonic, or the resulting mode. For example, if the progression was in a Mixolydian mode, the tonic chord was still identified as the V chord, rather than renaming it to I. The other chords in the progression were identified similarly. I identified the chord progressions in this manner to show you how the same major scale patterns and chords are used in the different modes. Thus a Mixolydian progression such as G-F would be identified as V-IV so that you could easily determine its parent key of C major. Believe it or not, this is not how most musicians think about chord progressions! Instead, they usually think of the tonic chord as “one” and number the rest of the chord progression from this starting place. The G-F chord progression then becomes I-bVII, as you come to understand in Fretboard Theory Volume II Chapter 2. 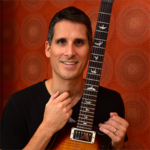 In Fretboard Theory Volume II Chapter 2 we will look at using a new number system, one where we number keys and chord progressions by starting from the tonic pitch (key center) rather than using the numbers as they occur in the parent major scale. 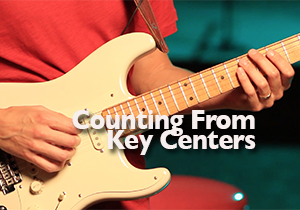 Counting from key centers like this reveals important details about keys, scale formulas, chord movement and harmony. We cannot advance to higher forms of music theory without first laying this groundwork. Many of the advanced concepts we explore in other Fretboard Theory Volume II chapters, like dominant function, modal mixture, and the harmonic minor scale, necessitate that we think and count from key centers.